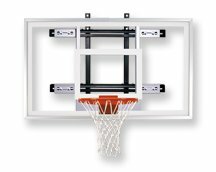 Looking for a wall mounted basketball system to make a shooting station in your gymnasium? Then look no further the Powermount Select mounts just 12" from the wall and provides a generous 36" x 60" acrylic backboard. The PowerMount Select Wall Mounted shooting station is designed to allow backboard installations in tight spaces where playing area is at a premium. If your facility requires a backboard installation close to a wall, call on First Team PowerMount Wall Mount series! The PowerMount structure allows for quick and easy installation of a basketball backboard on a wall with a minimal 12 inch of wall-to-backboard distance. The Powermount Select comes with a mounting structure, silver support structure, rectangular 36"x60" Acrylic Backboard, heavy duty flex goal with nylon net. All PowerMount Wall Mount packages come with a manufacturers Limited Lifetime Warranty. Approx. Shipping Weight: 130 lbs.